Morgan Church gains control of the puck at the Eagles game Tuesday. 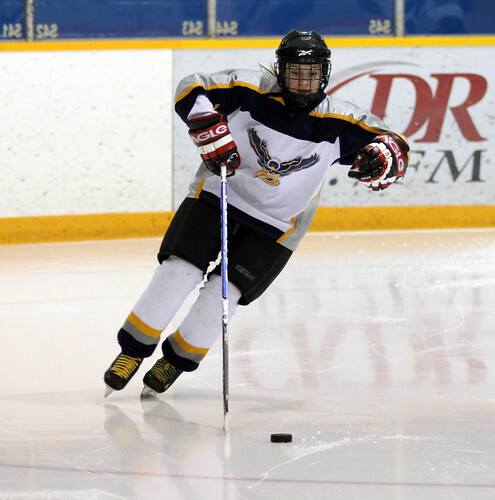 The Eagles Girls defeated the St. Thomas Aquinas Saints 4-1 Tuesday night in Dryden. Kyley Engstrom knocked in two goals while Lauren Shoguchi and Morgan Church added a goal each. Assists were by Alexis Reid (2), Lauren Shoguchi (2), Kristen Bartlett and Molly Dorfman. The girls travel to Kenora on Thursday to take on the Beaver Brae Broncos.